The Fort Hunter field season has wrapped up and now artifact processing is in full swing. As we clean and process the artifacts we are able to see more clearly what is present in the collection. It is important to examine the types of artifacts present in a collection as they help tell the story of the landscape and its use. In order for archaeologists to develop an accurate timeline for sites, several methods are used including stratigraphy, radiocarbon dating, dendrochronology, and artifact typologies based on datable artifacts. This year at Fort Hunter, we found the most complete example of a thimble to date. Thimbles may not be the first artifact type you think of when contemplating the kinds of artifacts that can help date a site, but in fact thimbles have a long and well documented history, though not widely published. There is documentation of leather thimbles as early as the medieval period in Europe. Bone, horn and wooden thimbles have also all been found on early archaeological sites (Hill 1995). The earliest metal thimbles in England appear in AD 1350 (Hill 1995). At this time thimbles were being made and decorated by hand, using various techniques including hammering, stamping and pressing. Like many other objects, later period thimbles were produced via mechanical methods of casting. During the 17th century some of these machine made thimbles were made through a slightly different process, making them from two pieces by attaching the separately made crown to the body. This process of manufacture is another clue to dating them. Various forms of thimbles through time: 14th century (left), 2-piece 17th century (center), 19th century pronounced rim (right) (from UK Detector Finds Database 2005). Just as the process for making thimbles changed, so did the form or shape and design on thimbles. It wasn’t until the fifteenth century that thimbles became taller and similar to their current form, while previously they were a short shallow cup-like shape (Hill 1995, UK Detector Finds Database 2005). The height of the thimble sides as well as the height of the dome varied between manufacturers as well as through time. Designs on thimbles also changed, beginning with hand punched “pits” or indentations in the medieval period and later changing to mechanically indented or knurled indentations (Hill 1995, UK Detector Finds Database 2005). The indentations or designs are most often small round indentations or can also be a waffle pattern. These varying patterns on the body or crown of a thimble can also indicate its age. Finally, the rim of a thimble can be indicative of a specific time period as some rims were left flat, whiles others were rolled. 18th Century thimble found at Fort Hunter (36Da159) during 2016 State Museum of Pennsylvania field season. With this brief understanding of why thimbles are considered datable, we can now look at the thimble found this year at Fort Hunter. As can be seen in the image, the Fort Hunter thimble is a one piece cast thimble with knurled indentations and the waffle-patterned crown. Based on historical research this form and design is often called a “Lofting” type of thimble, named for John Lofting a Dutch thimble maker, who produced large quantities of thimbles for export from England (UK Detector Finds Database 2005). It is believed that the Fort Hunter thimble represents the final development in the “lofting” form, which was quickly copied and exported by other European manufacturers throughout the 18th century. Another important aspect of having good datable artifacts on a site is that comparative analyses can be done between sites. In order for archaeologists to develop the most accurate picture of past life, how artifact and site types were used and to determine whether sites are contemporaneous, comparisons are made using as many examples of specific artifact and site types as possible. 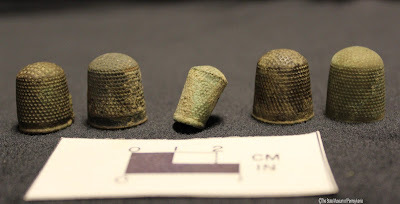 For example, there have been thimbles found at other French and Indian War period forts in Pennsylvania, such as the five 18th century Lofting thimbles, one 17th century two-piece thimble and one 19th century thimble with a concentric crown design found at Fort Loudon. Other examples of thimbles from Pennsylvania forts include two 18th century Lofting type thimbles from Fort Augusta and Fort Morris each. Fort Morris also has an example of a 17th century two-piece thimble. Having this information allows archaeologists to see that there are similarities in the form, decoration and ages of this artifact type which not only helps date these sites, but may also lead to further conclusions about who in these forts were using the thimbles: was it soldiers, a designated tailor or women (Gale 2007)? These are just some of the questions that can be explored by further analyzing the thimbles. Thimbles found at Fort Morris: 18th century Lofting thimbles (right and left), 2-piece 17th century (center) (image from Warfel 2010). So, through using previous archaeological evidence as well as the historic record these little artifacts have proven to be an important tool in helping archaeologists understand the period of occupation and activities for many sites. As a common domestic object, thimbles can help date a site or a component of a site through the artifact typology, as our Fort Hunter thimble helps us develop a better understanding of the landscape around the Fort Hunter Mansion. 1768. Track of the Wolf, Elk River, Minnesota. 1995 Thimbles and Thimble Rings from the circum-Caribbean Region, 1500-1800: Chronology and Identification. Historical Archaeology 29(1):84-92. 1969 A Guide to Artifacts of Colonial America. Alfred A. Knopf, Inc. republished by University of Pennsylvania Press, Philadelphia. 2010 The Discovery of Fort Morris: A Report on 2009 Archaeological Investigations at the 333 East Burd Street Site, Shippensburg, PA. It has been another busy and productive October at The State Museum wrapping up Archaeology Month celebrations and outreach programs. Fort Hunter artifacts are in process in the lab and the 2016 Workshops in Archaeology last Saturday was a well-attended event with over 145 participants. If you missed the Workshops this year, or would like to learn more about recent archaeological investigations and research in the region, we invite you to the Eastern States Archeological Federation (ESAF) 83rd Annual Meeting this weekend in Langhorne, Pennsylvania at the Sheraton Bucks County. Those interested in Paleoindian archaeology will find this year’s conference particularly informative. 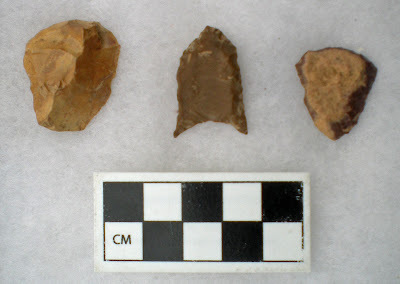 Fluted point and endscrapers from a Paleoindian component at the Snyder Complex site, NJ. Photographer credit: Kurt Carr. Thursday kicked off the conference with a well-received tour of two Paleoindian sites in New Jersey, the Snyder Complex and Plenge. However, it is still possible to attend Saturday and Sunday paper sessions. Walk-in registration will remain open Friday through Saturday afternoon. Follow the provided link to ESAF meeting registration for more details. Tour guides Jen Rankin (Temple University, AECOM), Michael Stewart (Temple University, New Jersey Historic Preservation Office), Leonard Ziegler (Society for Pennsylvania Archaeology, Archaeological Society of New Jersey), and Joe Gingerich (Temple University) deserve accolades for setting the prehistoric stage in a vivid and entertaining way on yesterday’s tour. Stories from their combined decades of archaeological investigation at these locations contextualized the sites, making them come alive in the minds of participants. Regular conference sessions begin today, Friday, November 4th. Kurt Carr, Senior Curator (The State Museum of Pennsylvania) and current ESAF President chairs a prehistoric session focusing on the use of lithic quarries in Pennsylvania by indigenous peoples. The concurrent session, chaired by William A. Farley (University of Connecticut), explores Native American cultural history spanning the Protohistoric, Contact and Early Historic archaeological record on the Eastern Seaboard. Early afternoon Contributed Papers, a session chaired by Ernest A. Wiegand (Norwalk Community College), discuss investigations at Allen Meadows: A Paleoindian camp in the Norwalk River Valley; and an elementary school archaeology outreach program at the historic School in Rose Valley, Stephen Israel (The School in Rose Valley). Late afternoon Contributed Papers provide a greater regional perspective of prehistoric lithic use, monument building, Hopewell influence in North Central Ohio, and Metz Transitional ware pottery. This session is chaired by Justin A. Reamer (University of Pennsylvania). ESAF Presenter, Session Chair and President Kurt Carr. Photographer credit: Beth Hager. Saturday sessions include a deep dive into Paleoindian Peoples and Landscapes of the Northeast, chaired by Jonathan C. Lothrop (New York State Museum) and Zachary L. Singer (University of Connecticut), and Urban Archaeology in Historic Philadelphia, chaired by Kevin Bradley (Commonwealth Heritage Group). A Contributed Papers session in the late afternoon continues on the theme of Paleoindian archaeology with in-depth analyses of tool use and experimental tool production. Chaired by Lucy Harrington (Mercyhurst University), her thesis research of Paleoindian through Middle Archaic bifaces and unifacial tools was largely conducted with collections curated at The State Museum of Pennsylvania. The Contributed Papers following the Historic Philadelphia session is chaired by our very own Curator, Janet Johnson and will be held in the late morning. These papers will cover an eclectic mix of historic and prehistoric topics from the Waynesburg and Blacksville Street Railway Company in Green County, PA, Marc Henshaw (Michael Baker International), to Intra-Family Tenancy in Antebellum West Virginia, Gary Coppock (Skelly and Loy, Inc). It is also an opportunity to see a repeat presentation of Effigies of the Susquehannock by Janet, who was a featured presenter at last week’s Workshops, as well as an overview of Social Complexity during the Late Prehistoric in Western, PA by John P. Nass, Jr. (California University of Pennsylvania). 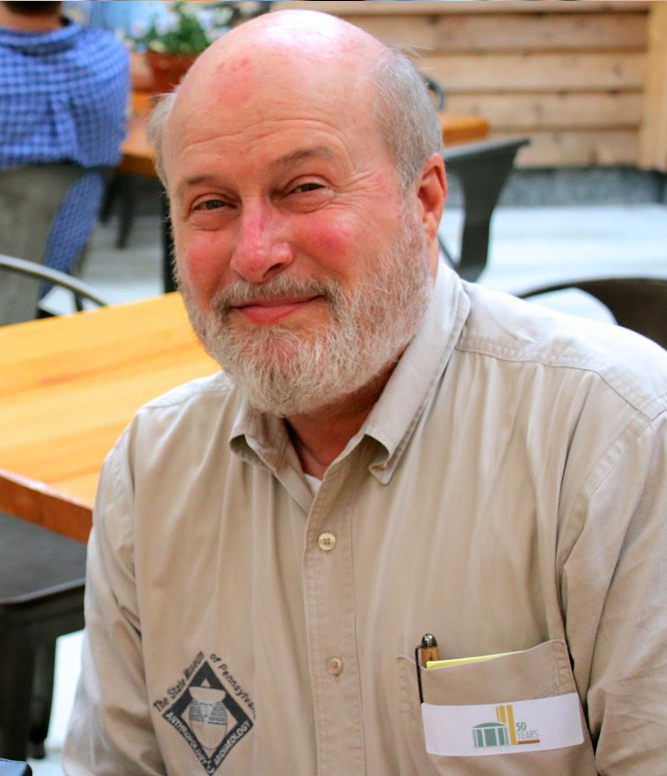 The evening will be concluded at 8pm with Banquet speaker, Roger Moeller (Archaeological Services), A Return to the Templeton Paleoinidian Site After 40 Years. Banquet tickets are now limited and may not be available at the door. ESAF Presenter and Session Chair, Janet Johnson. Photographer credit: Don Giles. The final session held on Sunday is chaired by Richard Veit (Monmouth University) and will also feature an array of prehistoric and historic papers from archaeological investigations in Delaware and New Jersey. 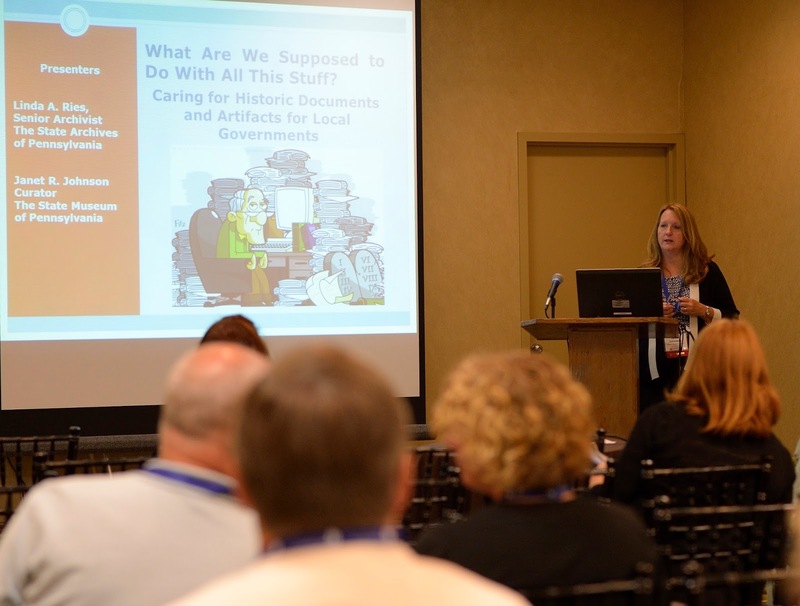 Use the following link to download an ESAF meeting schedule and presentation abstracts for a complete summary of events and speakers. On a final note the Section of Archaeology would like to extend a special thanks to all our dedicated volunteers who helped behind the scenes, making the 2016 Workshops in Archaeology a success: Andi, Clydene & Steve, Linda, Judy, Chriss, Paul, Toni, Phil, Yasmin, Aunyer, and Hope.